Perhaps this is common knowledge but for anybody interested in online advertising - it has been my experience that MPU ads tend to pull higher responses than leaderboards ads. Not actually sure if the Mini ad here is the standard MPU size (300x250 pixels), but is approximately the same format. 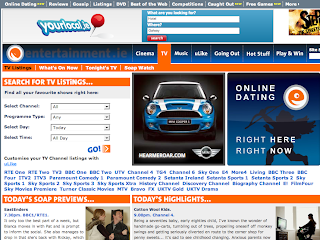 Looking at the image here, I'm sure you'd agree that the Mini ad stands out more than the yourlocal.ie ad at the top of the page? Of course, Mini is a great brand, and the creative is probably stronger but think it is partly due to the legacy 'banner blindness' positioning of the yourlocal.ie banner ad. People have learned to not look there anymore. But the MPU is placed around the content. Most brands I see tend to buy a suite of banner formats and positions. I wonder if certain brands just buy premium positions like MPUs just as they do when buying back pages of magazines or the first double-page-spread?